Do You Know Whats Really In Your Tea? Tea is something I drink every single day. It’s sacred at my house – I even have a whole drawer devoted to it! I drink it because it is amazing for your health. 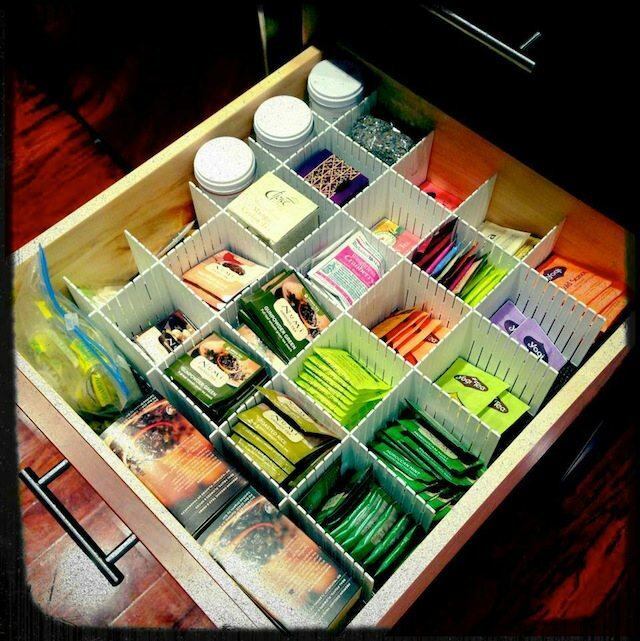 There are so many varieties of tea that can improve digestion, metabolism and even prevent certain diseases. This investigation into tea ingredients has been in the making for a long time. What I’m about to share with you totally rocked my world forever and I’ll never look at tea in the same way again. Do you really want to know what’s in your tea?…Then read on. The ancient Chinese tradition of drinking tea dates back thousand of years to the early Chinese dynasties and aristocrats who drank the beverage for its medicinal properties. In ancient times, leaves from the Camellia Sinensis (the tea plant) were either ground into a powder or placed as loose leaves directly into water to infuse it with herbal essence. Unfortunately, modern day tea is nothing like the unadulterated version of old tea. 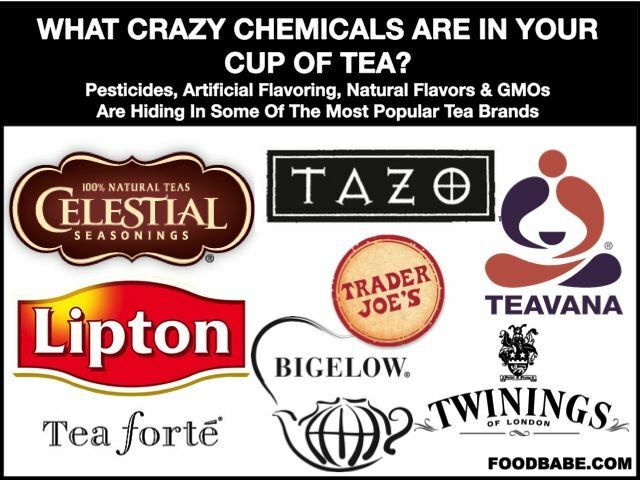 Many of today’s tea brands are operating under the guise of providing health benefits and promoting clean living, but are actually laden with pesticides, toxins, artificial ingredients, added flavors and GMOs. Did you know that most tea is not washed before it is put it into bags? That means if the tea was sprayed with cancer-causing pesticides, those pesticides go directly into your cup. And this is the reason why tea is on my organic shopping priority list. To prove this point, here are some shocking facts about one of the most well-known tea brands – Celestial Seasonings. A recent third-party analysis by Glaucus Research found that 91 percent of Celestial Seasonings tea tested had pesticide residues exceeding the U.S. limits. For example, Sleepytime Kids Goodnight Grape Herbal contained 0.26 ppm of propachlor, which is a known carcinogen under California’s Propsition 65. The “Wellness” tea line was found to contain traces of propargite, also a known carcinogen and developmental toxin. The FDA has already issued two warning letters to Celestial Seasonings in regard to poor quality control. Imagine what happens when pesticide-laden tea is steeped in boiling water. If grocery store brands don’t provide a clean option for you, perhaps a high-end loose leaf tea would circumvent some of the issues of grocery store brands. Right? Wrong! Take Teavana, which is found in malls across North America for example. Teavana taps into tea culture with the “Teavana Experience.” Convincing their employees to take customers on a sensory journey – they open a huge canister of loose leaf tea and wave the top of the canister so you can smell the tea – touting all of the wonderful health benefits of tea complete with samples and manipulative demonstrations that end in an expensive visit to the tea shop. Is all the extra money worth it? Are customers getting a superior tea product? No. Teavana tea was tested by an independent lab and 100 percent of it was found to contain pesticides. One tea in particular, Monkey Picked Oolong, contained 23 pesticides. 77 percent of the teas would fail European Union pesticide import standards, and would be banned from import. 62 percent of the teas tested contained traces of endosulfan, a pesticide that has been banned by the U.S., China, the E.U., and 144 other countries because it has been linked to impaired fertility and could harm unborn babies. 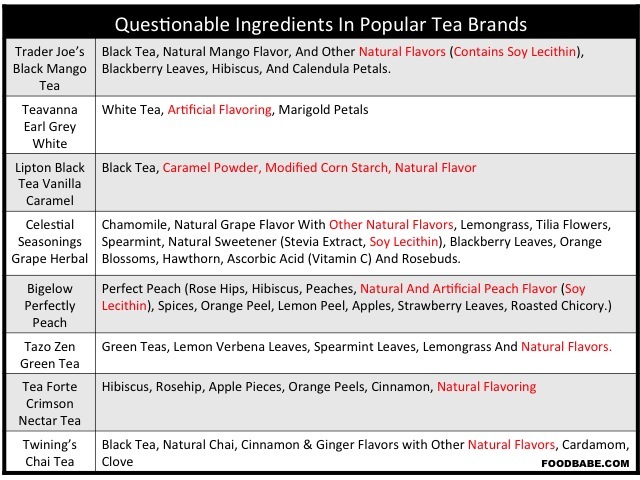 Furthermore, a majority of Teavana teas contain added flavor – specifically “artificial flavoring.” If their tea is so high end, why would they be adding ingredients produced by fractional distillation and chemical manipulation of various chemicals like crude oil or coal tar? Coal tar in my tea? No, thanks. Many popular tea brands get away with using the ingredient “natural flavors” to trick the consumer into thinking they are buying better, cleaner ingredients; however companies are just covering up the inferior taste and low quality of their tea. Fortunately, there are brands that are putting the kibash on the use of natural flavors and using all real ingredients. I was happy to learn that Ahmed Rahim, CEO of Numi Tea is just as disgusted by this ingredient as I am. He said to me “You can breakdown anything that is found in nature and if it ends up tasting like the flavor you wish to use – you can add it to any product and call it NATURAL FLAVOR on the ingredient label. It could come from a stone in the ground and you’d never know.” This is why when I see the words “natural flavor” listed on a label – I put the product down and run far far away. I want to know what I am eating! Don’t you? 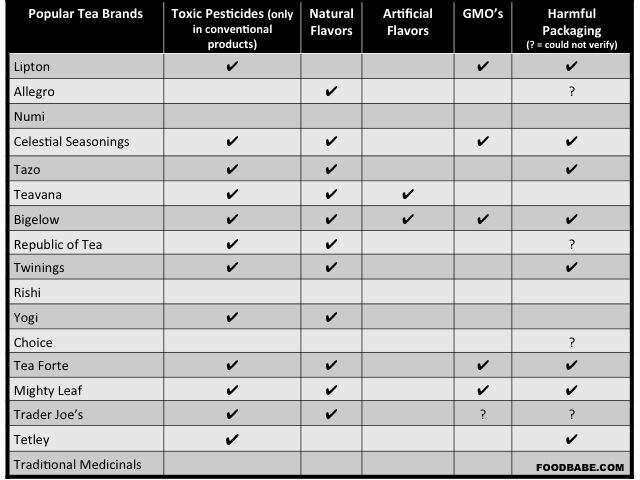 Additionally, the added risk of consuming possible GMOs is not something many people think about when consuming teas. Before this investigation and witnessing tea companies using modified corn starch and soy lecithin in tea (additives likely made from genetically engineered corn and soy), I didn’t think about it either! I can’t imagine having a serious soy allergy, considering all the places companies try to hide it. A recent article in The Atlantic discusses the “silky sachet” and “luxurious mesh bags” that hold loose leaf teas (like in brands Tea Forte and Mighty Leaf). Turns out, these modern day bags meant to showcase the tea leaves, are made of plastic. PLA (polylactic acid) is a (likely GMO) corn-based tea bag material that has attracted major tea companies due to its nice look and its claims of biodegradability. Terms like “silky sachets” and “corn-based biodegradable tea bags” mislead customers into believing a product is more natural and sustainable than it really is. While the processing for PLA removes all traces of genetic material, it is still made with genetically modified corn. Although the actual tea bag is not an ingredient like teas and herbs, it is an element that is put into boiling water. “While these plastics are generally considered among the safest in terms of leaching potential, the molecules in these plastic tea bags may still in fact break down and leach out when steeped in boiling water…” Well, isn’t that how tea is prepared? So, while the plastic itself won’t melt in your tea, the glass transition temperature could potentially leak out harmful phthalates if there are such things in your tea. Another thing to worry about is that some of the newer tea bags are made with a variety of plastics. Some plastics are nylon, some are made of viscose rayon, and others are made of thermoplastic, PVC or polypropylene. Beware of paper tea bags too, which can be worse than plastic tea bags. GET THIS: Many paper tea bags are treated with epichlorohydrin, a compound mainly used in the production of epoxy resins. Considered a potential carcinogen by the National Institute for Occupational Safety and Health2 (NIOSH), epichlorohydrin is also used as a pesticide. When epichlorohydrin comes in contact with water, it hydrolyzes to 3-MCPD, which has been shown to cause cancer in animals. It has also been implicated in infertility (it has a spermatoxic effect in male rats) and suppressed immune function. So what do you do the next time you want a cup of tea? Antioxidant rich teas aren’t going to do much to counterbalance the chemicals, additives and artificial flavorings in today’s modern teas. 1. Choose an organic & non-GMO certified brand of tea. (My favorites are Numi, Traditional Medicinals, and Rishi Tea (loose leaf)). 2. 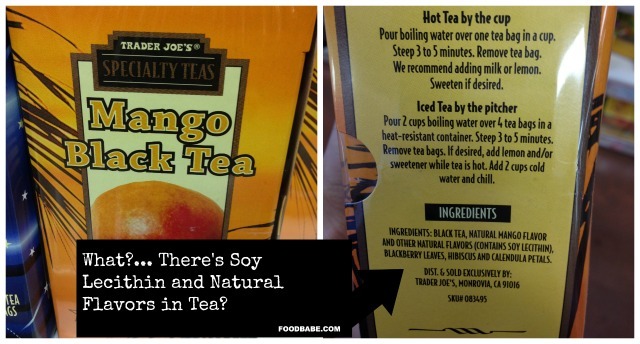 Check the ingredient list on the back of the tea package to make sure there are no added flavors, GMO ingredients like soy lecithin and corn starch added to the tea leaves. 4. The majority of restaurants use some of the most pesticide ridden tea and brands that have harmful packaging like Celestial Seasonings, Lipton, Bigelow, etc. Don’t fall victim to this. Bring your own tea when eating out or going to restaurants and ask for pot or cup of boiling water (remember to leave a good tip if you do this). I even do this at Starbucks because I like to vote with my dollars and not buy tea brands that are harmful. If you drink iced tea, brew your own at home and carry an insulated water bottle with you. 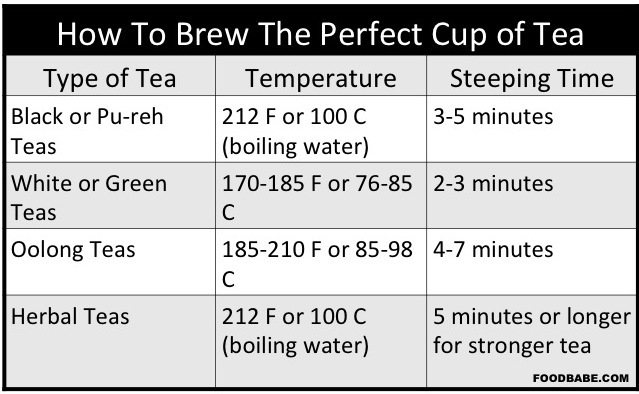 If you know someone who loves to drink tea, please share this post with them. I was just as shocked as you probably are about all of this craziness – knowing what’s in our tea and what we put in our body matters! Let’s change the world together.